Liczba stron: 13297 Jest to ujednolicona liczba stron, która ułatwi Ci porównanie długości książek. Każda strona Legimi to 200 słów. 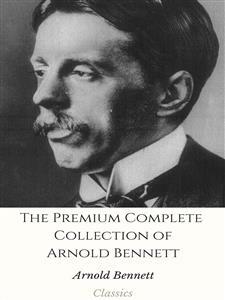 Arnold Bennett, in full Enoch Arnold Bennett (born May 27, 1867, Hanley, Staffordshire, England—died March 27, 1931, London), British novelist, playwright, critic, and essayist whose major works form an important link between the English novel and the mainstream of European realism.Bennett’s father was a self-made man who had managed to qualify as a solicitor: the family atmosphere was one of sturdy respectability and self-improvement. Arnold, the eldest of nine children, was educated at the Middle School, Newcastle-under-Lyme; he then entered his father’s office as a clerk. In 1889 he moved to London, still as a solicitor’s clerk, but soon gained a footing in literature by writing popular serial fiction and editing a women’s magazine. After the publication of his first novel, A Man from the North (1898), he became a professional writer, living first in the Bedfordshire countryside, then, following his father’s death, moving to Paris in 1903. In 1907 he married a French actress, Marguerite Soulié; they separated in 1921. Bennett is best known for his highly detailed novels of the “Five Towns”—the Potteries, since amalgamated to form the city of Stoke-on-Trent, in his native Staffordshire. As a young writer he learned his craft from intensive study of the French realistic novelists, especially Gustave Flaubert and Honoré de Balzac, who emphasized detailed description of people, scenes, and events. He also owes an immediate debt to George Moore, who was influenced by the same writers. Bennett’s criticism was of such high calibre that, if he had never written fiction, he would rank as an important writer. He was less successful in his plays, although Milestones (1912), written with Edward Knoblock, and The Great Adventure (1913), adapted from his novel of five years earlier, Buried Alive (1908), both had long runs and have been revived.As early as 1893 he had used the “Five Towns” as background for a story, and his major novels—Anna of the Five Towns (1902), The Old Wives’ Tale (1908), and Clayhanger (1910; included with its successors, Hilda Lessways, 1911, and These Twain, 1916, in The Clayhanger Family, 1925)—have their setting there, the only exception being Riceyman Steps (1923), set in a lower-middle-class district of London.Paris during Bennett’s eight years there was the capital of the arts, and he made full use of his opportunities to study music, art, and literature as well as life. He retained an understanding of provincial life, but he shed the provincial outlook, becoming one of the least insular of Englishmen. At a time when the popular culture and the arcane complacencies of the elite were equally inbred, Bennett was a cosmopolitan who appreciated Impressionist painting, the ballet of Serge Diaghilev, and the music of Igor Stravinsky before they reached London. Later, reviewing a constant stream of new books, he unerringly picked out the important writers of the next generation—James Joyce, D.H. Lawrence, William Faulkner, Ernest Hemingway—and praised them discerningly. When Bennett returned to England, he divided his time between London and a country home in Essex. He never returned to the Potteries except on brief visits, but he continued to live there imaginatively, much as Joyce did in Dublin.